Woodworker Dan Janssen launched Imperium in 2012, working with limited tools out of his 1880-built rowhouse. As demand grew for his hand-turned razors, so did the need for more space and a "real" workshop. Working alone in a spare and unheated space, but determined to keep up with growing orders, Dan’s days consisted of early mornings, late nights, and a couple of close calls with frostbitten fingers. He would often walk to buy a hot cup of coffee, or go for a quick drive, just to run his truck’s heater and thaw out his hands. But all the work was worth it: along the way, Imperium built a following and a reputation for making the most exquisitely beautiful and quality razors one can buy. Now, Imperium has found its new home– and a bigger team– in a historic mill building in Baltimore City's Clipper Mills complex. Since the 1840s, Clipper Mill has been a major site of industrial production: it was once home to the world’s largest lathe, capable of machining wheels 60 feet in diameter. In the shop, we strive to bring those old traditions into a new era, by using both modern machines and traditional woodworking tools to make each unique Imperium razor handle. The air is filled with the smell of sawdust and linseed-oiled wooden floor planks. Lathes and drills rumble and shriek over our favorite playlists and science podcasts. Look out the windows, and you’ll see the trails and woods of Druid Hill Park and the Jones Falls to the right. 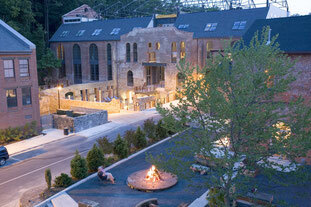 To the left, converted flour and cotton-duck mills are now home to artists' studios and restaurants. It’s the perfect spot for turning wood, just as generations of craftspeople and artisans have done before us. At Imperium Shaving, we treasure the ritual of grooming, whether it’s a straight-razor shave in a barber’s chair, or a late-for-work morning shave in front of your bathroom mirror. We believe that the things you use every day can and should be beautiful. Starting your day with a razor that’s a pleasure to see, to hold, and to feel on your skin is a way to be good to yourself. Imperium is committed to using 100% FSC-certified sustainable woods and ethically sourced materials in all of its products. We support local suppliers and artisans whenever possible, and strive to produce the absolute minimal amount of waste. We give back to our community here in Baltimore through donations, volunteer work, and, beginning soon, youth apprenticeships. In today’s world of quick bucks and mass-manufacturing, we believe that it’s crucial to incorporate handmade goods and traditional craftsmanship into the things you buy, use, and wear, whenever possible. Our razors are hand-turned and hand-assembled, with an attention to detail unlike any other. Each Imperium razor is held in two hands: ours, and yours. See the full line of Imperium razors HERE. Find out how to care for your Imperium razor handle HERE. For information about becoming an Imperium dealer, click HERE.